Eerie beauty: Sevan Biçakçi’s tiny masterpieces. Happy Halloween, my dears! Are any of you dressing up today? I hope so. I’m planning on putting something fun myself to wear while giving out candy to any to small monsters and ghosties who might happen to ring my doorbell later. 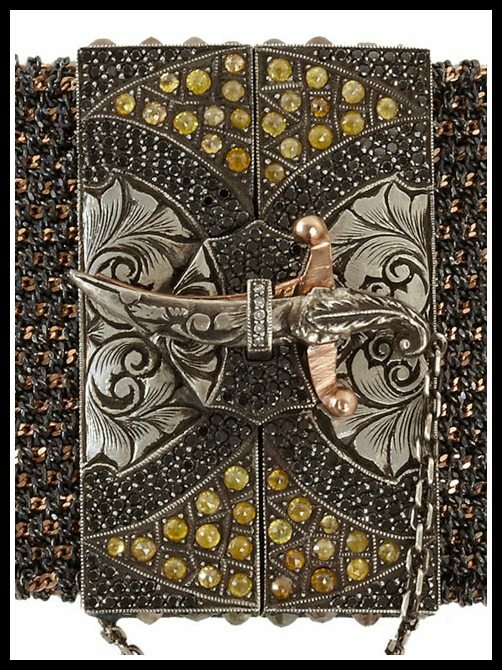 Instead of going full on creepy crawlies for Halloween, I’ve decided to show you a sampling of the work of incredible Turkish jeweler, Sevan Biçakçi. I don’t have full information on a lot of these pieces but they’re all going to be worth looking at, I promise you that. Not all of these pieces are spooky, but they all share an exotic richness that makes me think of Middle Earth or some other magical land. 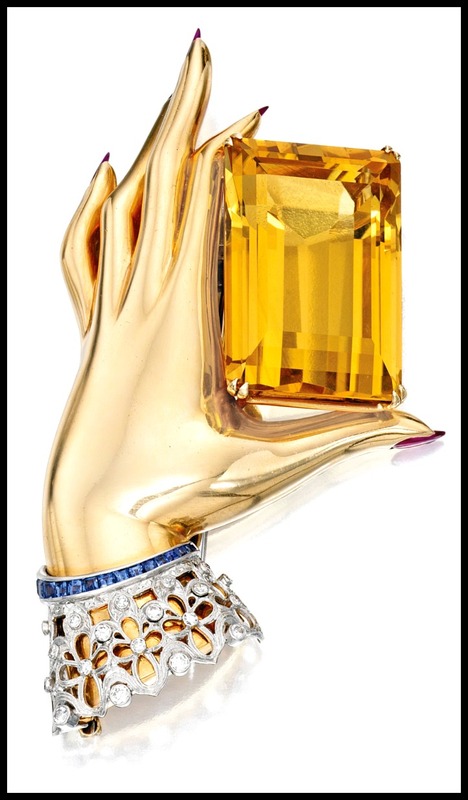 This Sevan Biçakçi ring is made in 24-karat gold and sterling silver with more than 3,000 hand-set multicolored diamonds, 164 hand-set seed pearls, and one South Sea baroque pearl. It’s an octopus, but there’s something almost spider-like about those tentacles, don’t you think? This piece is smaller but no less fierce. 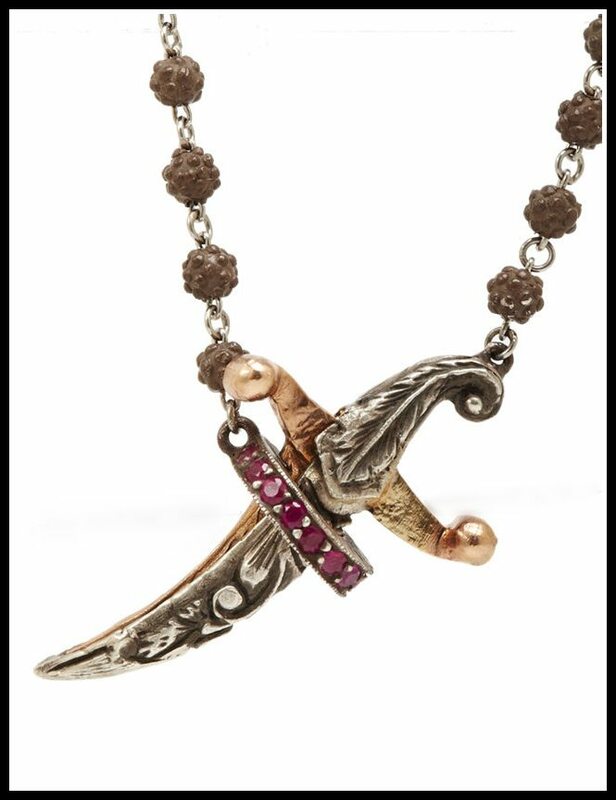 It’s a 24k gold and oxidized silver granulated ball chain necklace with an engraved rose gold Turkish dagger pendant featuring a sapphire-encrusted holder. 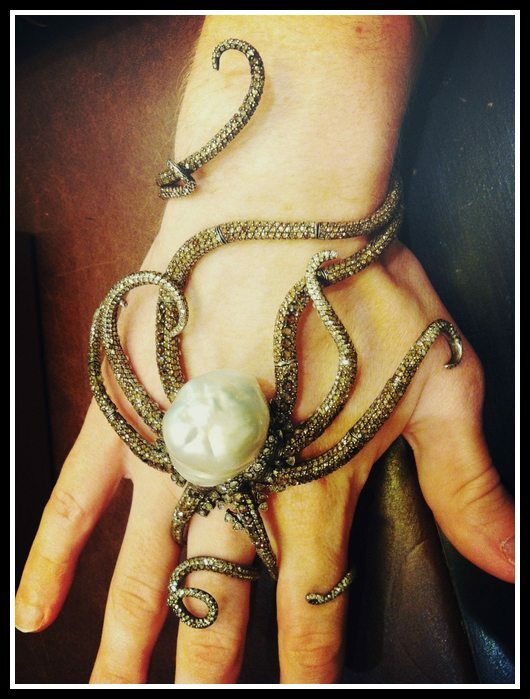 In keeping with the weapons theme, how fabulous is this cuff bracelet? 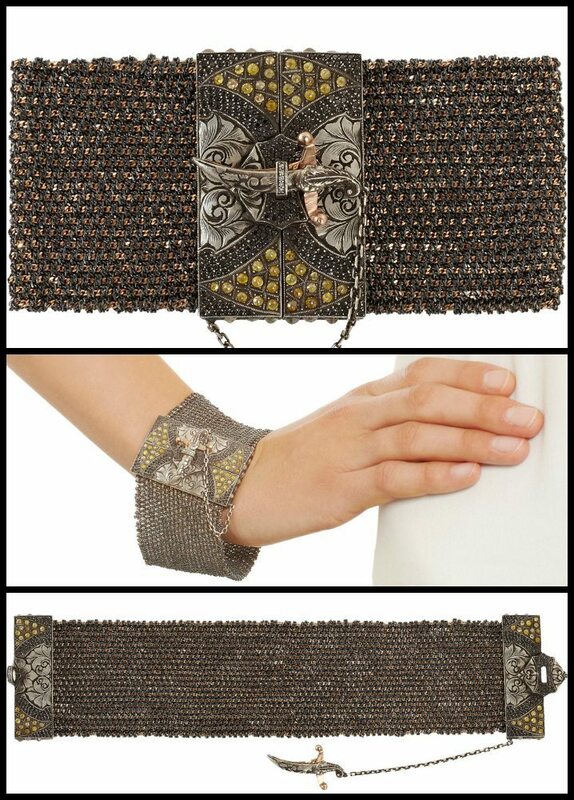 The bracelet is made of woven 18k rose gold and oxidized sterling silver mesh with a centerpiece set with black pave and rough cut diamonds. The bracelet fastens with a sword that dangles from a tiny chain. Here’s a detail shot of the bracelet’s central element for you. Here’s a ring for a Titania rather than an Oberon. 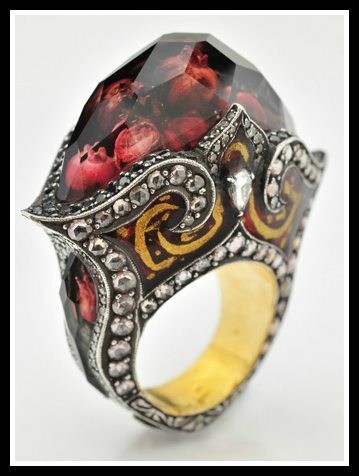 This diamond and amethyst flower ring features a hand-carved floral motif encased within a faceted amethyst stone. Surrounding the center stone is an intricate setting of 2.05ct white, brown, and yellow diamonds and 2.19ct sapphires. This red (ruby?) Sevan Biçakçi ring practically glows. Let’s end with another floral piece. This pendant features intaglio-carved tulips encased within a faceted citrine. 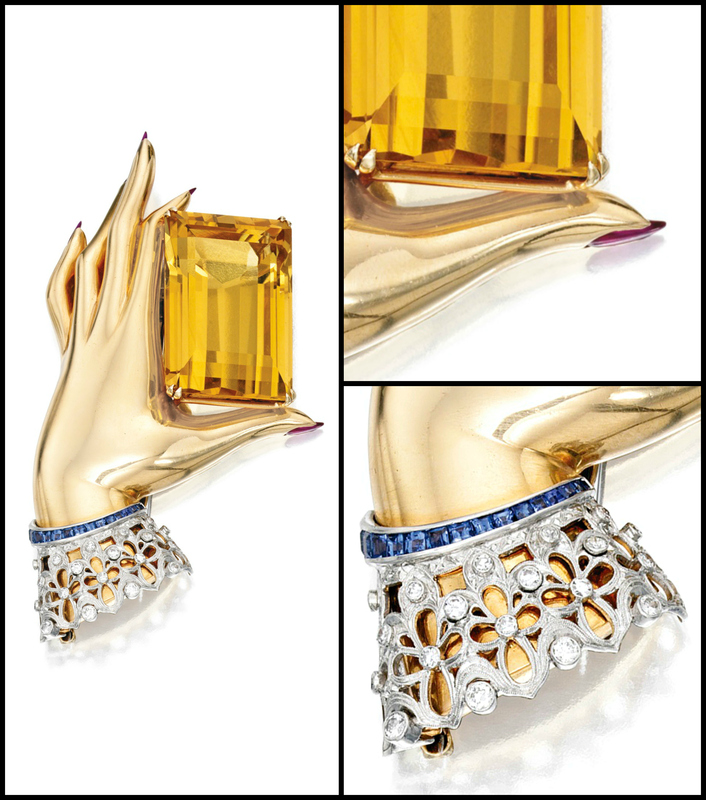 The citrine is surrounded by sapphires and white rose cut and black pave diamonds on a scalloped frame. The pendant hangs from 24k gold and oxidized silver cable chains. Despite the flowers, this pendant is anything but sweet. What do you think of Sevan Biçakçi’s aesthetic? Would you wear any of these pieces? 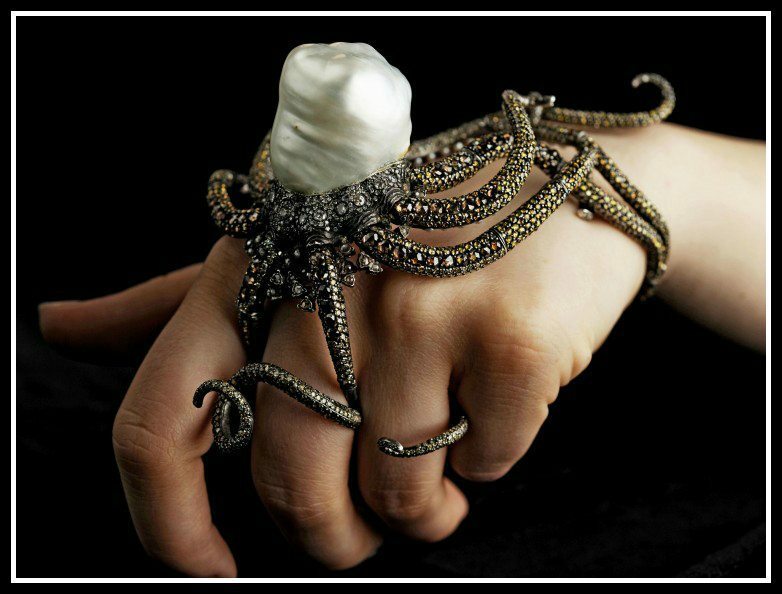 All images and info are thanks to the following sources: Octopus ring, dagger pendant necklace, diamond mesh sword bracelet, flower ring, tulip pendant necklace, all others via Sevan Biçakçi’s website.